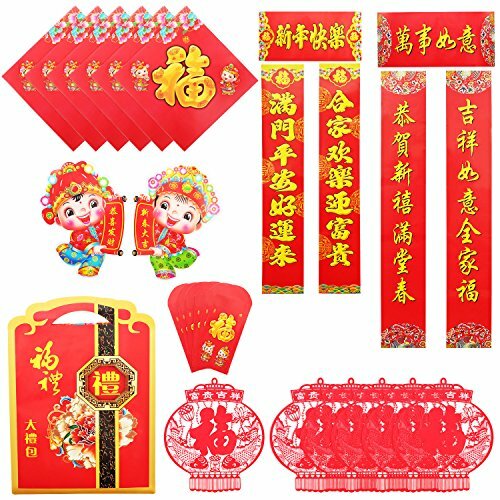 Includes chun lian, Fu characters, Fu stickers and door children stickers, packed in a Fu bag, paste them up to greet the new year. Paste couplets with banner on the doorways, and paste fu character stickers on furniture such as cabinets, walls, entrance doors, windows and so on, these festive home decorations will create a happy and cheerful atmosphere. The Chinese couplet set is suitable as a lunar new year gift for friends or family, is good decoration for home, offices, restaurants, or other places. Suitable for decorating your house at the time of the coming of the Chinese New Year, allow you feel the atmosphere of the hometown and enjoy a happy New Year.